There's a certain decade that's absolutely everywhere you look these days — so, now that the era is coming back again with a vengeance, I think it's worth taking a peek at some of the most iconic celeb dresses of the '90s. After all, it was a pretty great time for red carpet glamour, and the old trends are certainly worth paying attention to, what with their huge influence over the popular fashion of today. Liz Hurley's safety-pinned Versace? Totally like something a Kardashian would take out for a spin at Paris Fashion Week. All of the slinky slip dresses Shakespeare in Love star Gwyneth Paltrow donned over the decade? Well, it's already a look being happily replicated by mega-watt stars like Jennifer Lawrence. All in all, in a world where everything old is new again, the red carpet looks from 1990 to 1999 stand up quite well — many of the very best celeb looks would work just as well in 2016 as they did back in 1996. So, with all that in mind, let's take a quick look at 14 of the best red carpet moments of the era, from '90s icon Alicia Silverstone to bona fide red carpet queen Cate Blanchett. 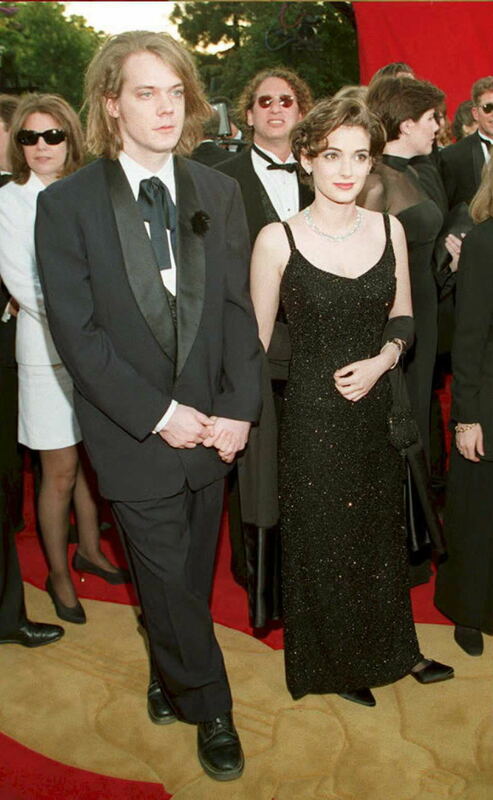 Winona had some of the best '90s red carpet game in the books, and that's a cold hard fact. Liz Hurley's Four Weddings and a Funeral premiere dress is pretty much the Versace icon to end all Versace icons. The thumbs up really makes this ethereal lilac number and floaty wrap sing. Though her iconic Oscars dress didn't come until 2002, this SAG Awards gown was certainly spectacular in its own right. Would that we all could rock daisies as well as Drew Barrymore. Though her safety-pinned dress is more famous, this white-hot number she wore to the Academy Awards was pretty darn awesome as well. Pretty much the epitome of the '90s slip dress — and her arm candy is nothing to sneeze at either (check out those lapels). The Clueless megastar made quite the splash in Vera Wang at the 1996 Academy Awards. Still one of the best dresses the Oscars have ever seen. Carrie Bradshaw in sequins? Say no more. Even almost 20 years ago, Cate Blanchett was wowing the red carpets with her unbeatable sense of style. Still my favorite SAG Awards dress ever. Leave it to Gwyneth to make it onto this list three times, no? Still, look at her: There's no denying the woman had some serious '90s fashion game.